From bestselling author Luanne Rice, a haunting and emotional short story, never-before released, and free to all readers. On the eve of a wedding by the edge of the sea, a once-in-a-lifetime storm sweeps through a family farm on the Connecticut Shoreline and sets in motion the events of The Night Before. 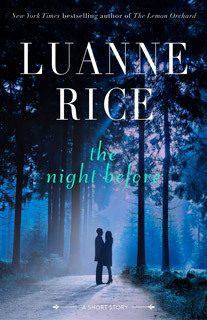 New York Times bestselling author Luanne Rice tells the powerful story of the young couple about to get married, a mother and daughter three thousand miles apart, and best friends who could never forget each other. Lydia Madison, an artist with a carefully guarded secret, grows Christmas trees with the help of Danny Byrne (last seen in Silver Bells) and Sara Castillo. This brand new short story connects to Rice's novel The Lemon Orchard and returns to the setting of Rice’s beloved Black Hall and Hubbard’s Point series of novels. Rice explores art and inspiration, the struggles of immigration, and the importance of place in art and life.